Description: On NS's Buffalo Line. 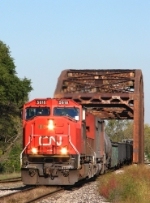 Description: CN 5618 leads a manifest train into Centralia. Description: CN engine # 5618 enters the Elucid Yard with a mixed freight. Description: CN engines # 5359 & # 5618 enter the Elucid Yard with a mixed freight. Description: CN engines # 5359 & # 5618 near Lakeshore Drive as they get ready to enter the Elucid Yard. Description: CN engine # 5618 crossing above Lakeshore Drive on a mixed freight. Description: CN engine # 5618 crossing above Lakeshore Drive with a mixed freight.